Unseasonably warm weather may have tricked the world's smelliest plant into blooming in the middle of the northern hemisphere winter, said botanists at the Eden Project where the native of Sumatra is housed. 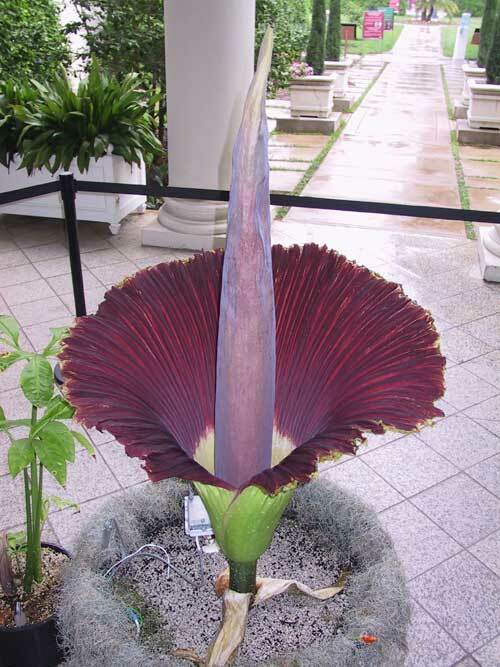 The warmth of 2006 and mild winter to date have encouraged the Titan Arum or Corpse Flower into a phenomenal growth spurt and into flower - an event that usually happens only once every six to nine years. Its smell "is a cross between rotten cheese, dog poo and something dead." It is HIGHLY ABNORMAL for the plant to flower in winter. "Last year's unprecedented warm temperatures and high sunshine levels and the extremely mild winter we are currently experiencing have to be considered as a factor in this RARE occurrence."